The plant body is divided into stem, leaf and root. Evolutionary studies suggest that organization of oldest land plant was very simple resembling leafless and rootless Devonian plant, Rhvnia. If seed plants have evolved from these plants then the leaf, the stem and the root would be closely related phylogenetically, ontogcnelieally. The organs have common origin in the zygote and the resulting embryo; and, in the apical meristems of the shoot, the leaf and the stem increments are formed as a unit. At maturity, the leaf and stem merge with in another internally and externally. The root and stem also constitute one continuous structure and also have many common features in form, anatomy, function and method of growth. In Angiosperms flower is, considered as homologous with a shoot and floral parts with leaves. Both leaves and floral parts are through to have originated from branch system. A vascular plant starts its life as a unicellular zygote (2n) which develops into an embryo and then into a mature sporophyte. This development includes Division, Enlargement and Differentiation of cells, and organization of cells into complexes, the tissue and system of tissues. The embryo of seed plant has an axis bearing one or more cotyledons with cells and tissues at a low level of differentiation. At the two opposite ends of the axis apical meristems of future shoot and root, called plumula and radical respectively, are present. After a certain period of vegetative growth, the plant enters reproductive phase. The increase in plant organs take place as a result of expansion in width and length. This initial growth of root and vegetative and reproductive shoot is known as primary growth. The resultant plant body is termed as Primary Plant Body consisting of primary tissue. In most Cryptogams (algae, pteridophytes) and Monocots entire life cycle is completed in primary plant body. Vascular Cambium – Producing secondary tissue resulting in increase in diameter of root and stem. Cork Cambium – or Phellogen – Usually develop in peripheral regions. Periderm – A protective tissue which replaces the epidermis. The units of a multicellular plant body, the cells are associated with one another in various ways forming masses of tissues. The tissues arrange themselves into larger units the tissue systems. The body of a vascular plant is composed of three systems of tissues. The dermal, the vascular and the fundamental or ground tissue system. The dermal system tissue system provides outer protective covering of the plant and is represented by Epidermis in primary plant body. During secondary growth, it may be replaced by Periderm. The vascular tissue system is composed of two major conducting tissues, the Phloem and Xylem. These tissues contain many types of cells such as tracheids, vessel members, sieve tube members, companion cells and parenchyma cells. The ground tissue system includes parenchyma (tissue composed of living cells which may differ in size, shape and wall structure), which may be modified into collenchyma (supporting tissue of young organs consisting of more or less elongated cells, the walls of which are usually unequally thickened) or into secondary structures. The ground tissue also contains mechanical tissue Sclerenchyma, the supporting tissue composed of fibers and sclereids. In stem, the vascular system occupies a position between epidermis and center of the axis. The in between areas are occupied by some ground tissues, the cortex (between epidermis and vascular region) and the Pith (in the center of the axis). In root Pith, may be absent and the cortex is shed during secondary growth. In leaf the vascular system consists of many interconnected strands embedded in the ground tissue, the Mesophyll (photosynthetic parenchymatous tissue situated between two epidermal layers of the leaf). The three tissue systems of primary plant body are derived from apical meristems. When derivatives of these meristems are partly differentiated, they may be classified as Protoderm, Procambium and Ground Meristem giving rise to epidermal, vascular and ground tissue systems. The following cell types and tissues are usually found in a vascular plant body. Epidermis cells form a continouslayer on the surface of primary plant body. The epidermal cells are two types. Epidermal Cells Proper: They form main mass of epidermis, vary in shape and often tubular. Epidermis may contain secretary and sclerenchyma cells. Epidermis cells of aerial parts of plant has a layer of Cutin on the outer walls which forms Cuticle. Epidermis provides mechanical protection and restricts transpiration. During secondary growth, the epidermis ix replaced by Periderm in roots and stems. It comprises of Phellem or cork tissue, Phellogen or cork cambium and phelloderm. Phellogen arises in epidermis, cortex, the phloem or the root pericycle and produces phellem towards outside and phelloderm towards inside. Cork cells are usually tubular, without protoplast at maturity and with suberized walls due to deposition of suberin. 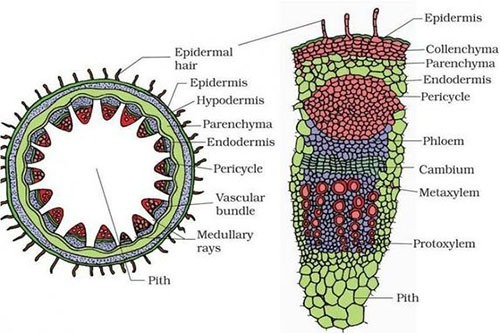 Parenchyma cells form continuous tissues in the cortex of stem and root, and the leaf mesophyll. They also occur in vertical strands and rays in the vascular tissues. They are living cells, capable of growth and division (meristematic cells). The cells vary in shape often polyhedral but may be stellate (star shaped) or elongated. They are concerned with photosynthesis, storage and wound healing. They may be specialized as secretary or excretory structures. Collenchyma is a living tissue with unevenly thickened walls and act as supporting tissue of young organs. The shape of cells varies from short prismatic to much elongated. Sclerenchyma cells may form continuous masses or they may occur in small groups or individually among other cells in any or all parts of the plant body. Sclerenchyma cells are strengthening elements of mature plant parts. There are two types of sclerenchyma cells. The Sclereids – vary in shape from polyhedral to elongated and often branched and the fibers – generally long cells. Xylem cells are found throughout the plant body in association with phloem cells. The tissue is concerned with conduction of water, storage of food and support. The main water conducting cells are tracheids and vessel members which join end to end into vessels. Storage occur in parenchyma cells whereas the supporting cells are fibers and sclereids. Like xylem cells the phloem cells are present throughout the plant body along with xylem. The tissue is meant for conduction of food, storage of food and support. The main water conducting cells are Sieve Tube Members which join end to end to form Sieve Tubes and companion cells. Both cells are enucleate at maturity. The supporting cells are fibers and sclereids. Secretory cells, the cells producing secretions, are present within other tissues as single cells or as groups of cells e.g., glandular epidermal cells, hairs, floral nectaries, etc., internal secretory structures are secretory cells, intercellular cavities or canals lined with secretory cells (resin ducts, oil ducts). The principal method for studying the minute structure of the plant body are by means of thin sections of the plant material and maceration in which the individual cells are freed from one another. For adequate comprehension of the complex structure of most parts of the plants, study of sections cut in more than one plane is necessary. One plane transverse to the long axis and the section cut out is termed as Transverse Section. The others parallel with the long axis, i.e., Longitudinal. 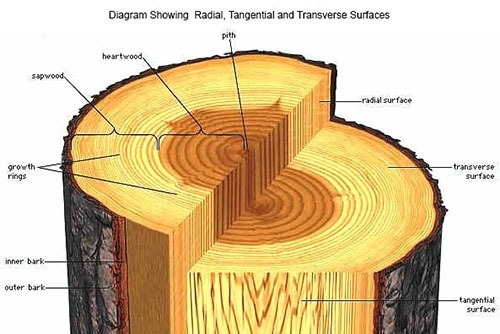 Of the two longitudinal planes, that dividing the cylinder radial is the radial plane and the resultant section is known as Radial Section While that at right angles to the radial plane is the tangential plane and the section cut out ii this plane is called Tangential Section.